We deny all of Filichia’s allegations and will vigorously defend our Constitutional right to free and open speech. This type of lawsuit, known as a SLAPP (stands for “strategic lawsuit against public participation”), is a malicious and frivolous legal maneuver, the purpose of which is to quash free speech. While such a suit may bluster endlessly about libel and damage to business and reputation, it is first and foremost a tool used by companies with major customer service problems, who would rather sue those who criticize them than address the problems. SLAPPs are intended to have a chilling effect on people’ rights to self expression and opinion. Everyone’s free speech is a fundamental right in America. Defense of that speech must be taken seriously, and pursued with as much ardor as the defense of our other freedoms and liberties. The authors of this website, having been unsuccessful in their efforts to settle the lawsuit without court action, have hired Marc J. Randazza to represent them. Mr. Randazza is the managing partner of the Randazza Legal Group, and splits his time between the Las Vegas and Miami offices. He is a nationally-known First Amendment and intellectual property attorney, and handles litigation and transactional matters nationwide. RANDAZZA LEGAL GROUP is a group of attorneys committed to serving clients in sensitive positions, protecting free speech and adding value to client’s businesses. The firm represents clients on a wide array of First Amendment issues, copyright and trademark protection and infringement cases, defamation cases, domain name disputes and employment law matters. Tara M. Warrington will assist Mr. Randazza. Ms. Warrington heads up Warrington Legal PLLC , a general practice law firm, with special focuses on tax law, business law, foreclosure defense, real estate, bankruptcy, and consumer legal issues. Ms. Warrington provides us with strong local knowledge, skills, and capabilities from her Melbourne offices. She also has a special background in First Amendment law, having studied under (and subsequently, provided legal services for) Marc Randazza. As Randazza’s and Warrington’s clients, we believe strongly in Americans’ right to speak freely, openly, and honestly about any and all matters, however delicate or unpopular. That is why we have sought the absolute best representation to handle our lawsuit defense against Filichia Insurance Agency. 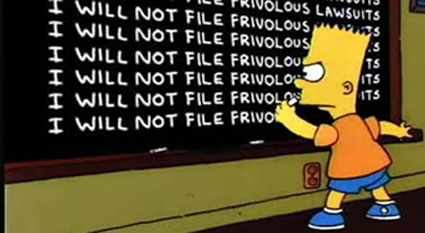 We feel Filichia has filed a frivolous lawsuit against us. If anyone’s ability to speak out can be stopped simply because it is difficult, stressful, or costly to stand up for that basic right, we all lose, big time. We hope the reader understands and accepts this “inconvenient truth”, and if a similar situation arises, acts to protect his or her own rights. Our case is now certified to be heard in the Brevard County court. Given that the plaintiff has stated that our speech has caused/is causing immediate and irreparable injury, and they also have demanded that our speech be removed and permanently enjoined, it is our belief that our next step may be to defend ourselves against a plaintiff motion seeking a temporary injunction against our website and forum postings. Our speech is “all we have”, so this would be an important defense. Would you be willing to wear a muzzle every minute of every day, for the rest of your lives? To live in fear of offending someone richer and more powerful than you? We say “no”, and by vigorously defending this lawsuit, we will contribute, in our small way, to preserving this dwindling , possibly endangered, American freedom. The following article provides a good discussion of the topic of libel, slander, and defamation. Thanks and credit to the source of this information, the ExpertLaw.com website. Damages are typically to the reputation of the plaintiff, but depending upon the laws of the jurisdiction it may be enough to establish mental anguish. While actions for defamation have their roots in common law, most jurisdictions have now enacted statutes which modify the common law. They may change the elements of the cause of action, limit when an action may be filed, or modify the defenses to an action for defamation. Some may even require that the defendant be given an opportunity to apologize before the plaintiff can seek non-economic damages. Under the First Amendment of the United States Constitution, as set forth by the U.S. Supreme Court in the 1964 Case, New York Times v Sullivan, where a public figure attempts to bring an action for defamation, the public figure must prove an additional element: That the statement was made with “actual malice”. In translation, that means that the person making the statement knew the statement to be false, or issued the statement with reckless disregard as to its truth. For example, Ariel Sharon sued Time Magazine over allegations of his conduct relating to the massacres at the Sabra and Shatila refugee camps. Although the jury concluded that the Time story included false allegations, they found that Time had not acted with “actual malice” and did not award any damages. The concept of the “public figure” is broader than celebrities and politicians. A person can become an “involuntary public figure” as the result of publicity, even though that person did not want or invite the public attention. For example, people accused of high profile crimes may be unable to pursue actions for defamation even after their innocence is established, on the basis that the notoriety associated with the case and the accusations against them turned them into involuntary public figures. Would you have ever imagined? You get sued by your insurance agent, and that prevents you from getting insurance? Well, that just happened to us. We contacted Bob Filichia at Filichia Insurance Agency of Titusville, Florida. We requested that Filichia find us general commercial liability insurance, covering our rental properties in Florida. Filichia sold us insurance, which (once we finally received the policy to review more than a month after paying for it) was not as we requested and was pretty much useless. We immediately canceled the policy and requested a full or pro rata refund. Filichia did not follow through on the refund, and we lost a large percentage of our premium money. We complained to him verbally, and were treated worse than unwelcome guests. We complained about him online (through this website and postings on review websites like Yelp), and Filichia sued us for defamation and business interference in Brevard County Court. So, lucky us, we get to waste thousands of dollars of our fixed retirement nest egg, defending a lawsuit against some idiot who can’t do his job right and gets hurt feelings whenever someone (us) tells him he screwed up. But this is not the end of this story… We suffer through all this grief and stress with Filichia Insurance of Titusville, and we still need liability insurance for our rental properties. So, we recently contacted a local insurance agency we know and trust, someone we have worked with for several years, Viera Insurance, and requested that they quote rates for an umbrella policy, to cover rental property liability. We received a quote for umbrella coverage through Viera by USLI. And, unlike the incapable idiots over at Filichia Insurance, Viera Insurance provided us with the actual policy documents for our review and approval, before we were asked to pay for the policy. We reviewed the policy and found that it has, as a precondition for coverage (also known as a “Prior to Binding Requirement”), that we cannot be the defendants in any pending lawsuit. As is obvious here, we are defendants to a lawsuit, because Filichia Insurance is suing us because they do not understand that they made mistakes, won’t accept any blame for their screw-ups, and do not have the customer service mindset, or person/business integrity required, to fix the problem. We informed Viera of the lawsuit. Viera checked with USLI, and with all other companies they quote, which write umbrella coverage. Viera reported back to us. They said, unfortunately, no insurance underwriter will bind an umbrella policy for you, because you are being sued by Filichia Insurance. The irony? All along, we have been trying to buy some form of liability coverage for our rentals, the general category of which includes umbrella policies. We gave Filichia a shot at our business, they fucked up, and now they want to lay the blame for their misdeeds on us. And, as a result of their outrageous legal action against us, we are barred from getting the liability insurance that we so desperately need. Filichia Insurance’s actions against us have placed us at great risk of a catastrophic lawsuit, from which we have no insurance protections. The fact that we are vulnerable — the blame and fault for which we assign completely to Filichia Insurance — we consider to be potentially actionable. They will be liable to us, if we end up destroyed by such a lawsuit, the cause of which will entirely be their frivolous and baseless lawsuit against us. Nice place to be, huh? Wish you were us? Further news on the insurance front. As discussed above, we do most of our insurance business with Viera Insurance. We recently contacted Viera to obtain a homeowner’s/landlord’s policy for a Titusville condo. Unfortunately, due to the pending lawsuit, I do not have any companies that I can write your rental homes with at this time. You may want to check with Citizens Insurance as they may be able to assist you. Please let me know if you have any questions. Citizens probably would not write coverage either, and if they would, the coverage would have a very high premium and exclusions. We currently have insurance policies in-force on our other rental properties. We are at risk of having some or all of those existing homeowner/landlord policies canceled due to the Filichia lawsuit. Basically, if the companies writing the policies find out about the lawsuit, then they may cancel the policies. So, once again, Filichia’s thoughtless and malicious lawsuit against us has put us at grave risk. This situation cannot be left unaddressed. We intend to respond. Remember what Mom told you: Actions have consequences.